CMC created the Pick Off Strap so that a rescuer could quickly connect to the victim and then adjust the strap to the desired length. CMC Pick Off Strap works well for positioning the victim for a lowering or rappel-based pick off or for an assisted rappel. We added a loop to the end for a more positive grip when pulling to adjust. Our ProSeries blue web improves the long-term performance, especially where it threads through the buckle. D-Ring end is rated at 8,039 lbs. (36kN). Depending on how the buckle is loaded, it will begin to slip between 3,500 to 4,500 lbs (15-20kN). Tying off the buckle will increase the strength. Weighs 13 oz. The Pick Off Strap continues to be used for quick attachment to the subject, effecting the weight transfer, and then positioning the subject above the rescuer for best control. 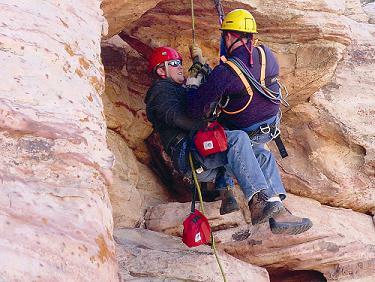 Not all subjects are injured or require immobilization and transport in a stretcher, so a rappel-based rescue can often be used. One common rappel-based rescue involves transferring the subject onto the rescuer's descender. This is usually referred to as a "pick off".